Life is an adventure and for Joshua, the ride is wild. There are so many good things happening in his life right now. I hardly know where to start. We’ll start with his adventure in becoming verbal after 35 years of being non-verbal. Joshua had gotten very comfortable with eye-gaze. He knew where the different boards were, how to navigate from page to page. I have to watch him like a hawk because he can go online in the blink of…well…an eye. The problem was he still wasn’t writing and reading on a level that is functional. Enter my sister, Kathy. She is a licensed teacher. She has a few health issues that compelled her into early retirement but anybody who knows my sister knows idle is not an option. She possesses the zero tolerance for boredom that my family is known for. Problem #2: Kathy and Joshua live two states apart. But I am nothing, if not inventive. When Joshua attended a Celtic Thunder concert in Kansas City a few months ago, Kathy and Josh met up at the hotel we were staying in. And with Kathy on a laptop, Joshua on his tobii, and me using the iPad we figured out a way to use Google Hangouts. Joshua attends class Monday through Friday. Kathy shows up via the iPad and Joshua uses his Tobii to respond to her. They talk. They study. He is learning to read and write and his abilities are growing by leaps and bounds. Adventure # 2. After the Celtic Thunder concert, Joshua and I got a phone call from Kathy. 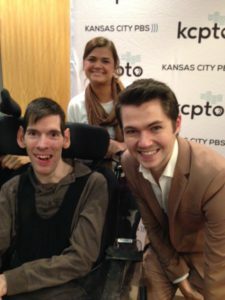 Her son, who works for KCPT studio in Kansas City, had a proposition for Joshua. Damian McGinty, stepping out on the beginning of a solo career wanted to perform in KC and he, through his representative, told my nephew that if Joshua would show up, the tickets would be comped. No way was Joshua going to pass that up. So back to Kansas City we came. Problem #3: The performance almost didn’t happen. Damian McGinty was flying out of Portland, Oregon and his flight was cancelled. He had to jump through hoops to make the venue. I have to give him a lot of credit. He put on a performance that was more fun than anything Joshua and I had ever attended. It was a blast. I think we have witnessed the start of a major solo career. Damian was funny, encouraged audience participation which made it super fun for us, and he unveiled some original material. One of the original songs he sang was titled Innocent Eyes and I predict this song will be a major hit. It’s a great song. Someday, I want my nephew to give me a tour of the studio. But for the purpose of this blog, I will say that Joshua had his picture taken with an interesting character. 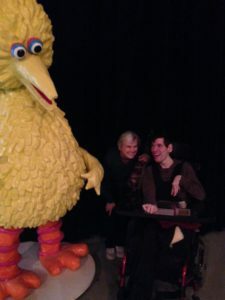 Joshua had his picture taken with Kathy and Big Bird. You can tell from Joshua’s expression how cool he thought this was. My niece, Linsdey was kind enough to get in the photo. And you can see how nice Damian is. He greeted Joshua by name, and proceeded to be the kindest, nicest man you’d ever want to meet. I’m going to be keeping my eyes out for this young man. I predict he’s going to go far in the music field. Yes, Life is an adventure. We are entering 2017 with great energy and goals. Fun times coming for OurHome Studio.